Trollhättan is another of those places people like me are just going to like. 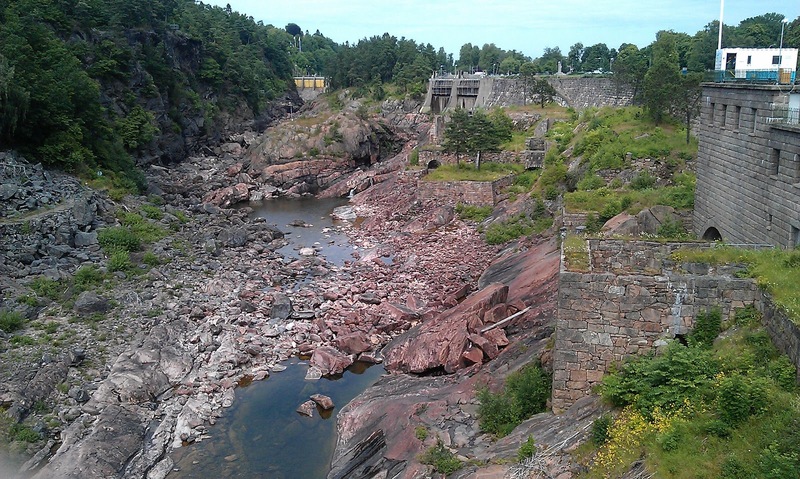 Historically it was as far up the Göta river as boats could come into the interior of Sweden before hitting some inconveniently placed 30m high waterfalls. All that is in the past, now, with the falls bypassed by locks and canals. Each lock is hacked or blasted out of solid rock which means, once it's hacked, there's not much more you can do with it when it's served its time, apart from abandon it and start a new one. So, the old locks are still there in successive generations of size and depth, from the original which could barely have handled a narrowboat (and never handled anything; it was just too ambitious in height to for the gates to have withstood the pressure) to the present day one which can take small ships. 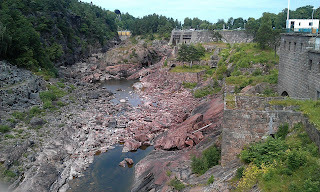 ... but even more picturesque when the sluices open for 10 minutes at 3pm every day to relieve pressure and 300,000 litres a second comes barrelling down the gorge. A bit like watching those tsunami videos, it all seems to be happening so slowly. The water seems to take forever to reach you and yet suddenly it's there and you're really quite glad that you're not, and are in fact on the 30m high bridge overlooking the scene. If Ozymandias had dug into rock rather than built statues of himself out of it, there would be a lot more evidence of his works to despair at.